This ring is a good quality ring. The stone is large and brilliant. I put it on not knowing if the size I chose would be true to the correct measurement. It was! I'm now waiting on the 2 birch ring so I can wear them as the wedding set I originally was given at my wedding! 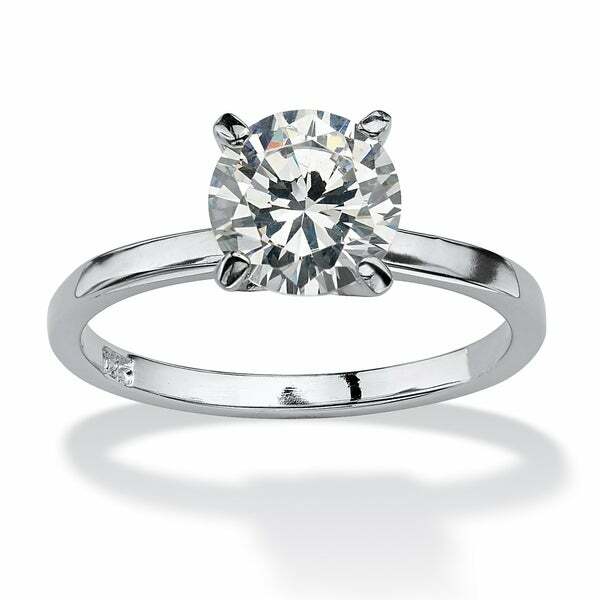 A ring that expresses eternal love ­ gorgeous 2 carat round cubic zirconia solitaire is a beauty set in sterling silver. Sizes 5-10. Dimensions 0.28 In. X 0.75 In. X 1.08 In. This ring is so glam. It's sterling silver and the stone looks so real. So I purchased this after reading the many reviews that were either really great or not so great. But, I really was simply looking for a solitaire that was simple yet beautiful and a statement piece. This was definitely it! The solitaire is HUGE but ... I LOVE it! At first when I just opened up the super cute pink box it came in and put it on, I wasn't so sure about the ring because I thought ... "It's sooo big it looks soo fake." But after wearing it now for a week, everyday, I LOVE it! I am happy to say the CZ has NOT fallen out and I am hoping it NEVER does, but the ring for the price and for sterling silver is absolutely worth it despite the fact the CZ itself is on the BIG side. I wear a size 5 ring and on overstock, the smallest they go IS a size 5. When I put it on, the fit is great however, after wearing it all day, the ring DOES get a little loose. IF there was such a size, I would probably go down to a size 4.5 on THIS ring only because it IS slightly maybe a half size too big. Of course, that matters because you dont like having to feel you are going to loose the ring if it falls off. I would say, for someone like me who wears very simple jewelry, who does not wear expensive jewelry because I don't care for expensive and I simply loose too much jewelry, and I love the simple and elegant things in life ... that being said, I LOVE this ring! The only reason I would not give it 5 stars is because the CZ is so big you have to get used to it (5 in MY opinion) but may be a 4 in others because of the size of the CZ and it looking too fake. I don't have any real diamond jewelry so I do not know what a real diamond is to look like, but for this price, this looks beautiful! Otherwise, for someone like me ... I couldn't care less if it did not look like the REAL thing, I love that it is beautiful and if I were to ever lose it, I would always be able to get a replacement. I was very excited when I received the package, however, the ring I received is not exactly as described. I specifically ordered a ring with a 2 ct. stone and the one I received is definitely not more than 1 ct. which was a huge disappointment for me. It is a beautiful ring, so no problem with that but for me the stone is much too small. I know what a 2 ct CZ should look like as I'be had them before. So I may send this one back or I may give it to someone else as a gift. Not sure yet. In any case I will look elsewhere to find the size I'm looking for. 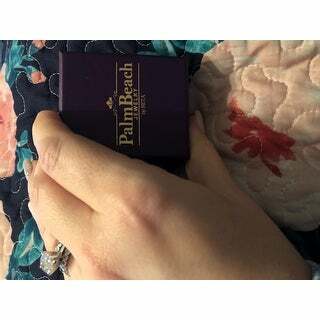 I don't like to wear my 2 carat diamond ring when traveling so I bought this ring. It's gorgeous and very sparkly! I'm the only one who knows it's a CZ and not a real diamond! It looks just like my diamond ring but I don't have to worry about it being stolen or lost while traveling because it is so reasonably priced here on Overstock! I just love this ring and never take it off. The CZ stone is brilliamt and the sterling silver ring itself is heavy and well made. I prefer sterling sliver jewelry over gold and this ring rivals anything I have that was much more expensive. This is a beautiful, very believable CZ solitaire. I love it paired with a wide silver band. Looks like the real thing! I love, love, love this ring! It looks totally real, I get a lot of compliments on it! It's very durable, as I wear it all the time! My real engagement ring is not as pretty!! I just love this ring! I bought this to wear on vacation. I like the stone, good sparkle, accurate, 8mm size. It sits up high, which I like. The silver is sturdy and not flimsy. The only thing I didn't like was that the stone is set a little crooked when you look from the side. You can see this on the display picture, but I didn't think mine would be like that. It's not very noticable and it looks so good from the face up position, I decided to keep it. It goes well with a stacking effect of smaller bands around it. It's really a size 71/2. I wear a size 71/2. But try to find that. The reviews for this ring said that it was a little large for a size 7. So I bought this ring and it fits just right for me. The setting is fine also. It works for me. I am highly impressed with this ring. In most lighting, you cannot tell from afar that it's fake. When I got mine, I immediately put clear nail polish all over the silver areas, including the prongs -but you have to be careful not to get it on the CZ diamond. This will not only keep the ring from tarnishing, but gives it a high gloss shine like white gold would look. Also, in the mornings when I put it on, I scrub, lightly, the CZ, with a soft toothbrush and small amount of toothpaste. This gives the CZ a nice shine and keeps it from appearing dull like most CZ's. When I went to Macy's department store to look at a real 2 carat round diamond, I took this ring off and set it on the counter. Upon first glance, the lady behind the counter thought it was real. Some people criticize this ring saying it looks fake. Of course it does, it is fake. But there are some things you can do to give it an appearance of being real without having to spend $1,000 on a AAA quality CZ. Love this ring and can't believe it's only $30. I love it! Very sparkly and looks real! Bought it to wear on vacation so I can leave my real one at home in the safe. 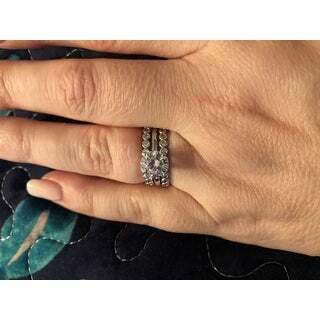 I bought this along with an eternity band and get so many compliments on them both. You'd never know it's not real. The stone is not too big, not too small. Has nice color and picks up the light very well showing the rainbow colors in it's sparkle. Sizing seems true, silver finish is bright. I paired it with a white gold band I have and wish I would have bought the matching band to this. Love it for my travel ring and would buy again. This ring is very pretty. I have small hands and this ring is just the right size. I am very pleased with my purchase. My ring has turned YELLOW after a month or 2. The ring WAS BEAUTIFUL, BUT IT NOW LOOKS CHEAP AND UGLY. AND NO I DID NOT WEAR IT EVERYDAY. I never washed it vigorously and I took precaution by keeping it out of water!!! Holding up well and looks so real. Absolutely beautiful and it looks so real! So beautiful, I have recieved so many compliments on this simple, yet stunning ring...so happy with my purchase! very real looking. lots of compliments. The size is perfect, but there is almost no sparkle. Wish I had returned it. Would love one like it with some flash. I just received this lovely ring today and it’s shiny and beautiful! My original ring is too big after losing weight and needs to be sized, I might just continue wearing this one bc I love it! I’m happy with this purchase and love overstock! Thank you for such amazing prices and and amazing products! This is one of my favorite online places to shop, I always check here first! I love this ring. I ordered it to wear when I travel and it looks great. I have actually had to order it twice because I lost the first one! 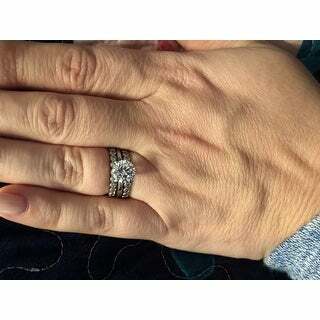 My fiance loved this ring. It looks worth way more than the price you pay for it. "What does the 3 year protection plan include?" I need a ring similar to my real ring for work. "what size is the stone? 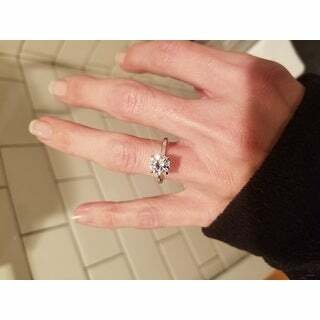 i need 0.5 (I lost my engagement ring, i need cheap replacement for now), please help :("
Hello ners2b, the stone is approximately 2 carats. Thanks for shopping with us!